Spring is here, and it's time to soak up some sunshine in the Hershey Harrisburg Region! From blooming gardens and bike paths to the towering coaster hills and chocolate treats, we have all the spring activities you need for a refreshing weekend getaway! Get the kids out of the house for some outdoor adventure at Hersheypark® Springtime In The ParkSM, where 50+ rides are waiting for you! Take a walk in the sunshine at Hershey Gardens or meet and greet the local animals at ZooAmerica® or Wildwood Park & Nature Center. Try an adult spring break with your pals filled with wine tastings, brewery tours, and upscale-casual eats. Stretch your legs on our hiking trails or take a bike ride around this happy, springtime destination! Wheeeeeeee! 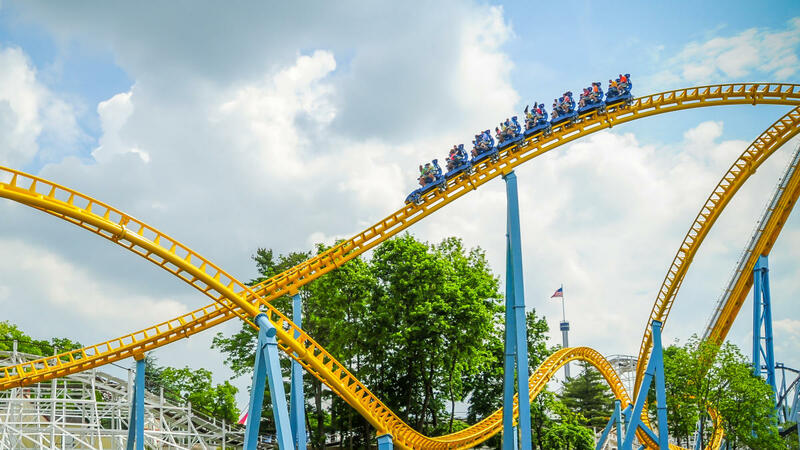 If you&apos;ve been dreaming about Hersheypark all winter long, Springtime In The Park is your first chance to catch a thrill in 2019! The gates open in April for seven happy days, including 13 coasters ranging from mild to wild, along with family favorites like the Carrousel, Ferris Wheel, and Kissing TowerSM. You’re sure to find life-size candy bars - Hershey’s Characters - roaming around the park, eager to take a family photo with you! We bet the family could use a little getaway, so make your trip and overnighter filled with even more sweet attractions and family fun! You’ve endured months of freezing temperatures, hours of snow shoveling, and a handful of 2-hour delays. Okay, now forget all about it as you feel the warm sunshine on your face, hear the birds chirping, and see the trees and flowers blossoming again! Take a refreshing weekend getaway to the Hershey Harrisburg Region to enjoy nature walks at Wildwood Park, blooms and butterflies aplenty at Hershey Gardens, and awakening wildlife at ZooAmerica® North American Wildlife Park. Grab your sweetie or a group of your best pals for a spontaneous overnighter filled with wine tastings and vineyard walks, beer flights and brewery tours, and hard-to-choose-just-one delicious dining options. Place your bets on a good time at Hollywood Casino at Penn National Race Course, including a chance to try their new sports betting experience, The Sportsbook. Plan for a luxurious Hershey’s Dark Chocolate treatment at Meltspa By HersheySM where you’ll be wrapped in relaxation…and chocolate! It’s time to stretch those legs and get your body moving after hibernation! Hike our scenic trails, including a portion of the famous Appalachian Trail, just 20 minutes north of Harrisburg. Pack a picnic for an active afternoon at Little Buffalo State Park, walking among the wildlife, boating, or fishing. Pedal around Harrisburg on the Capital Area Greenbelt, a 20-mile urban bike path filled with natural green spaces, scenic sights, and panoramic city views. Catch an invigorating barre or cycle group workout class at The Dailey Method that’ll get you shorts weather ready. RELEASED FROM HIBERNATION, YOU'RE READY TO HAVE SOME FUN AND WE'RE OPENING OUR PATIOS, GARDENS, AND ATTRACTIONS TO WELCOME YOU!